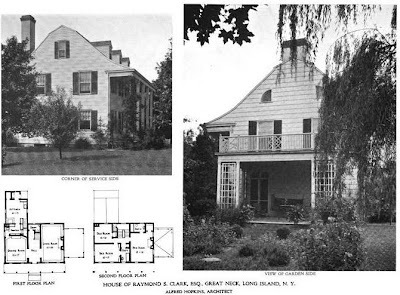 The residence of Raymond Skinner Clark, designed by Alfred Hopkins in Great Neck. 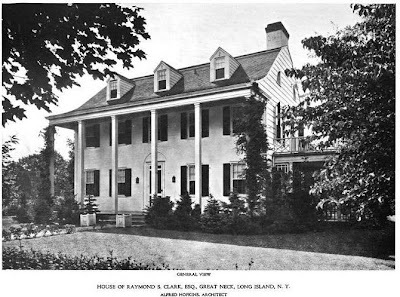 Clark was the manager of the New York office of William Skinner & Sons, silk manufacturers. Clark's son married Junius Spencer Morgan's eldest daughter in 1937 (the two gave the late J.P. Morgan his first great-grandchild in 1938). Unknown if the house is extant. you sure you didn't pick up the south carolina arch. review magazines by accident. except for that really interesting roofline, this looks like another house from the GWTW set. maybe thats why you can't find it - they moved it to hollywood.